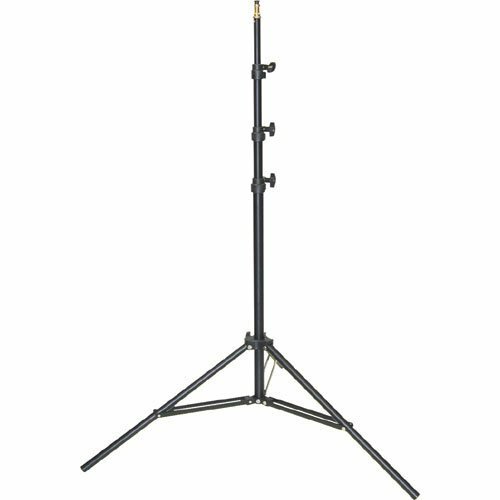 The Polaroid 8' black aluminum air cushioned four section light stand with sure-twist section locks provides you the reliability you need in studio for your lighting needs. It can support a wide variety of lights, softboxes, backgrounds and other various lighting needs. With the air cushioned shock feature you will be able to protect your equipment or "fingers" from any harm in case you forget to tighten any of the sections of your light stand due that the light slowly descends due to the air cushioned feature. With its compact design when folded it will fit easily in most cases. It has rubber tips on the legs to prevent any sudden movements.